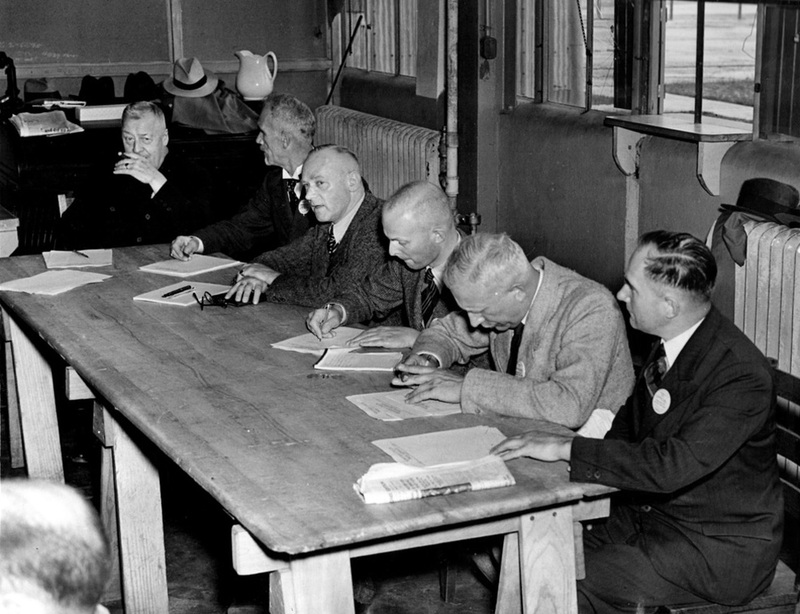 German Board of Inquiry at Lakehurst, May 14, 1937. Left to right, Hugo Eckener, Ludwig Dürr, Joachim Breithaupt, Gunther Bock, Max Dieckmann, and Walter Hoffman. ON MAY 6, 1937, AT LAKEHURST, U.S.A. It was the mission of the commission to investigate the causes of the airship catastrophe in cooperation with the American Commission appointed by the Department of Commerce. The German investigation commission received the fullest assistance of all American authorities in its work. After the return of the commission from U.S.A., a series of tests were made in the laboratories of the German Institution for Aviation Research (Versuchsanstalt fur Luftfahrt), Berlin-Adlershof, the radio telegraphic and air electric testing station GRAEFELFING and of the LUFTSCHIFFBAU, Friedrichshafen, to investigate thoroughly the conditions which may possibly have been the causes of the fire. Following is the report of the result of the accident investigation and of the experiments made in consequence thereof. The airship LZ-129 (Hindenburg) was constructed by the Luftschiffbau Zeppelin in Friedrichshafen as the 118th airship and was placed in operation at the beginning of 1936. After a large number of test flights, the airship on March 19, 1936, received its airworthiness certificate from the Reichsminister for Air (inspection Department for Aircraft). After acceptance by the DEUTSCHE ZEPPELIN REEDEREI, the airship made a total of 55 flights in the year 1936, in the course of which it covered about 300,000 kilometers (186,420 miles), crossed the ocean 34- times, and transported a total of about 2,800 passengers and more than 170,000 kilograms (374,782 pounds) of mail and cargo without accident. Before the airship resumed its flight schedule in the year 1937, it was subjected to reinspection by the Inspection Department for Aircraft and its Airworthiness Certificate was renewed. The airship departed for the first 1937 North Atlantic trip from Frankfurt am Main (On The Main) on May 3, 1937, at 20.15 (8:15 P.M.) Central European Time, with a crew of 61 persons, and was under the command of Captain Pruss, who had commanded a large number of previous trips of the airship; on board were also 36 passengers. In addition there were carried 108 kilograms (239 pounds), of mail, 148 kilograms (326 pounds) of freight, and 879 kilograms (1938 pounds) of passengers1 luggage, and two baskets containing dogs. At the landing approach at Lakehurst there were still left 8,500 kilograms (18,739 pounds) fuel oil, 3,000 kilograms (6,614 pounds) lubricating oil and 21,900 kilograms (48,280 pounds) water. The crossing of the ocean was uneventful except for retardation by opposing (head) winds. New York was flown over at 14.00 o’clock (2×00 P.M.) Eastern Standard Time. From there the course was set for Lakehurst, which was reached at 15.00 (3:00 P.M.). But the landing was not made then as a wide electric front was approaching Lakehurst from the west. The subsequent course of the ship was along the shore-line in advance of the electrical front, which slowly moved off towards the north after reaching the coast. The airship was in continuous communication with the Lakehurst aerological station regarding weather conditions. Then proceeding on a southeasterly course in the direction of Atlantic City with the electrical front to starboard, the ship received a radio message from Lakehurst at 17.12 (5:12. P.M.), to the effect that the weather conditions now were suitable for a landing approach. Consequently the airship turned around and headed towards Lakehurst, thereupon entering an area of increasing rain. At 18.08 (6:08 P.M.) it was suggested by Lakehurst that the landing be made as soon as possible. When the airship approached the Lakehurst station from the West-Southwest at an altitude of 200 meters (656 feet), the lower cloud level over the station was 600 to 900 meters (1,969 to 2,953 feet), and slight rain was falling. But the sky showed signs of clearing from the west. The barometric pressure was 755 millimeters (30 inches), air temperature 16° C., relative humidity 98%. The ground wind was light and variable. On first passing over the field the commander of the airship noticed that the ground crew was drawn up to correspond to a wind direction from the East, and that the landing approach therefore had to be made over the mooring mast in the westerly part of the field. The airship therefore went beyond the field about 5 to 6 miles, swung in a wide turn, and then approached from this direc¬tion towards the landing mast. Since, in the meantime, the wind had shifted towards southeasterly, the airship veered off to port to be able to approach into this new direction, and after completion of this second turn approached the mast from a northerly direction. The maneuvers executed during the landing approach have been laid down in Illustration No. 4. During the execution of the large turn, about 10 minutes prior to the dropping of the landing ropes, gas was valved from the five forward gas cells twice for 15 seconds and once for 5 seconds. For the same reason water was dropped three times at frame 77 for a total of 1,100 kilograms (2,425 pounds). The engines, after completion of the first large turn, were placed on “idling ahead”. During the approach in the last curve, several brief engine maneuvers were executed. About 2 minutes prior to the dropping of the forward landing ropes, all engines were brought to “full speed astern” for the duration of about one minute. Afterward, the forward engines were placed on “idle ahead” and the rear engines on “idle astern”. With the exception of a short burst of “full ahead” on the forward engines, the engines remained this way to the end. The distribution of the crew at the moment when landing ropes were dropped appears in Illustration No. 5. Due to the tail heaviness of the ship, 6 men had been sent to the bow from the midsection during the landing approach in order to trim the ship heavier by the bow by this means. At the moment when the forward landing ropes were dropped, the control car had an altitude of 90 meters (295 feet) above sea level, that is, about 60 meters (197 feet) over the ground. First the starboard landing rope and immediately thereafter the port landing rope was dropped. The port rope was at once connected with the rope of the hauling-in winch car because the ship began to drift toward the west, which then tautened considerably, whereas the starboard rope was held by the landing crew. The main bow cable, which served to connect the ship to the mooring mast had been let out about 15 meters (49 feet) at the moment when the fire broke out and was therefore still far away from the ground; the handling ropes at frame 62 also had been let out. The pendant at frame 47 was just being paid out at the moment of the beginning of the fire and had only run out a few meters (yards). Immediately prior to the beginning of the fire, fluttering of the outer cover on the upper port side between frames 62 and 72 enclosing cell No. 5 was observed by one witness (R. H. Ward). As the ship had no headway on and the propeller slip stream had to pass far below the point of the fluttering, this wave motion of the outer cover had possibly been caused by gas which was escaping from a gas cell. At 18.25 (6:25 P.M.), about four minutes after the dropping of the landing ropes, the fire broke out at the stern of the ship. The testimony about the location of origin of the fire is, to a great extent, widely divergent. The explanation for this is to be found, in the first place, in the very speedy propagation of the fire itself, and then in the different positions which the different witnesses held at the landing of the ship and in the great size of the ship itself which made a comprehensive view very difficult. Evaluating the testimony of witnesses with these facts in mind, the conclusion is to be reached, that the first fire started on the topside of the ship and specifically in front of the leading edge of the vertical stabilizer over gas cells 4 and 5. From there it spread forward about 20 to 30 meters (66 to 96 feet) in the course of some 15 seconds until the first explosion took place. The further progress of the catastrophe can be seen from photographs 6 to 11. (NOTE: In Photographs 7 and 8, two falling water ballast tanks can distinctly be seen, which had been torn loose from their fastenings by the shock connected with the explosion). Between the first appearance of the fire and the contact of the main body of the ship with the ground, there elapsed about one half minute. It appears from all testimony of witnesses that the landing of the airship was executed in a completely normal manner according to the opinion of all experts, and that the behavior of the whole crew prior to and during the catastrophe was exemplary} furthermore, there is no indication that the snip, prior to the landing approach, had perhaps not been in a faultless technical condition. The ship was completely demolished by the fire as photographs 12 to 14 show. A thorough inspection of the wreckage therefore did not yield any clue to the possible cause of the fire. Although, furthermore, the landing was filmed from several points, that part of the airship in which the fire started was not included thereby, as the preparations for the landing were mainly at the bow of the ship and the cameras were all aimed in that direction. Amateur pictures of the stern of the ship immediately at the beginning of the fire also could not be procured. The only course remaining then, is to draw conclusions from the testimony of witnesses as to the possibilities of the origin of the fire, and to determine by theoretical and experimental analyses which of these possibilities can be considered and which have to be excluded. I. Has the ship been the victim of a criminal attack? II. Did a series of physical or other circumstances combine in such a way that a fire could result? To clear the first question, the location of the accident and the wreck of the airship were thoroughly investigated for suspicious clues by the German and American Commissions and their experts. Furthermore, the crew members were thoroughly questioned as to whether they had noticed anything out of the ordinary in this connection. Outside of this, all suspicious angles, expressed in numerous communications to the German and American Commissions were investigated. (a) Devices which were fastened to the inside of the ship. (b) Effects originating from outside the ship. The attachment of devices which by way of timed detonators or other releases are able to cause an explosion had necessarily to be effected prior to or during the flight. It is proven that the supervision of the ship and all persons in contact with the ship prior to and during the flight had been done very strictly and thoroughly, so that the introduction as well as the attachment of such foreign objects within the ship was very nearly impossible. As an effect from the outside on the airship, shooting with an incendiary bullet can be considered. In view of the numerous persons present and the American enclosure of the field, only shots from nearby seem possible out of a silenced gun in a group of persons working together or shots from a long range weapon. In any case the danger of detection would have been very great on account of the large number of people present. Against ignition by an incendiary bullet, there militates the fact that a heavy explosion occurred during the conflagration. But as experiences with kite balloons during the world war have demonstrated, balloons set off by an incendiary bullet burn generally without an explosion, as large amounts of explosive mixture cannot form. All other possibilities of explanation as for instance, attack from aircraft cannot be considered. 1. The presence of a combustible mixture of air and gas. 2. The occurrence of an ignition to set this mixture afire. In the following, both cases will be investigated separately. 1. Development of an inflammable hydrogen – air mixture. a. Diffusion of the hydrogen through the cell walls. The walls of the gas cells consist of two cotton cloth layers between which a gas-tight film is imbedded and they possess a mean permeability of 1 liter/per square meter (1 quart/per 11 square feet) in 24 hours. As a purity check on April 28, 1937 shows, the purity in all gas cells was uniformly good; it can therefore be assumed with certainty that the gas cells at the time of the last flight were in faultless condition and the fabric of the cell walls showed no objectionable permeability due to ageing. The lower limit of combustibility of a hydrogen-air mixture is at a content of about 15% in weight of hydrogen in air. Because of the good ventilation of the airship, it is completely out of the question that through normal diffusion of the hydrogen through the cell walls such a rich mixture could have formed as was claimed by one witness. b. Sticking of a valve. Between each two cells a gas shaft leads to the topside of the ship where it is covered by a hood opening rearward. The draught appearing at the hood causes a strong ventilation of the gas shaft and the interior of the ship: in this it is assisted by the chimney effect of the air warmed in the interior of the ship and rising in the shaft. Above the axial walkway, from each gas cell two valves operate out into the gas shaft, one of which opens automatically upon reaching the pressure-height, whereas the other one is manually operated from the control car for maneuvering purposes. As the ship during the latter part of the flight was only about 80% full, it can be asserted with certainty that the automatic valves did not operate during this period. The maneuvering valves on cells 4 and 5 where the fire first was observed, were operated for the last time about 10 minutes prior to the dropping of the landing ropes. It seems not completely excluded, that one of these valves got stuck during this action and gas could thus escape into the shaft. The degree of fullness is kept under observation in the control car by means of a precision pressure meter, which records as the lower limit of exactitude, differences in the inflation of 0.2 meters (8 inches) in height. In an 80% full gas cell therefore, with sufficient attention, the escape of about 100 cubic meters (3,531 cubic feet) of gas can be recognized. Whether the precision pressure meters were observed during the latter period of the landing approach with such an attention could not be determined. It may be stated however, that failures of the maneuvering valves on the airships “Graf Zeppelin” and “Hindenburg” have never been observed, except once during a flight to South America in the year 1936 when an automatic valve got stack, the construction of which afterwards was changed. c. Entering of a propeller fragment. In the wreckage of the airship a propeller fragment of 30 centimeters (12 inches) length was found at the port motor, and was covered up by outer cover fabric and was unburned. But after thorough investigation, this piece of propeller was in all probability only torn off after the motor and propeller hit the ground. This is indicated especially by the fact that the four blades of the rear port propeller had been broken off in various almost evenly differing lengths as must be the case if a running motor hits the ground. This observation coincides also with the testimony of the witness Deutschle who was in the rear port engine car and who did not observe any vibration of the engine prior to the crash, as would have to have been the case in the breaking of a propeller. In order to prevent the gas cells from coming into direct con¬tact with the framework, a system of steel wires is placed within the framework, and the cell walls bear against such wires. It sometimes, though very rarely, has happened that a wire of this wiring system has parted. But up until now, this never has had any consequences with respect to strength of the airship or the condition of the cells. It is nevertheless conceivable, that by chance a wire of the system tore during the larding approach of the ship, and that the sharp end of the wire caused a leak in one of the rear gas cells through which gas could flow into the space between cells and outer cover. This assumption is supported by the fact that the ship appeared to be strongly tail-heavy during the last turn so that a part of the crew was sent forward from amidships and also that gas was twice valved from the forward cells and a total of 1100 kilograms (2,425 pounds) of water ballast was dropped in the rear. The escaping gas can also have caused the observed flutter of the outer cover. As furthermore, the ventilation decreased in consequence of decreased head¬way, an inflammable hydrogen-air mixture could have developed inside the ship’s covering in such a manner. 2. Ignition of the gas mixture. Ignition by mechanical means would be conceivable if a construction element, for instance a tension wire, breaks causing a spark thereby which ignites a gas mixture present at that spot, At the moment of the first fire, the ship no longer had headway, so that the development of large stresses, which could have caused the breaking of a wire, is totally unlikely. Tests, which have been made at the Luftschiffbau Zeppelin have furthermore given the result that the energy of a spark at breaking of a wire is not sufficient to ignite a hydrogen-air mixture. A hydrogen-air mixture can ignite itself when flowing over certain structural materials acting as catalysts. But structural materials utilized in airships are out of the question as catalysts. It appears likewise com¬pletely out of the question, that any matter acting as a catalyst, as for instance sponge platinum could get to the spot where the fire was first observed and could remain there active for any lengthy period. Causing of fire by exhaust gases or flying sparks from the motors was investigated extensively in joint experiments of the Luftschiffbau Zeppelin, the D.V.L. and the Inspection Department for Aircraft. The exhaust gases of the Diesel engines of the airship have a temperature of about 600° C at highest power output immediately after leaving the cylinder into the exhaust pipe. By mixture of fresh air into the exhaust system, their temperature is decreased to about 500° C at the exit from the powercar, or gondola. Only 0.25 meters (10 inches) distant from the exhaust exit, the temperature of the exhaust gases is already decreased to around 350° C. This temperature is far below the lowest ignition temperature of a hydrogen-air mixture, which depends strongly on special circumstances and is around 550° 0. Sparks present in the exhaust gases, especially with sudden fuel delivery, which consist in the main of glowing oil carbon particles, have a considerably higher temperature than the exhaust gases themselves. It would be conceivable, that sparks from the exhaust of the rear engine cars have been carried to the topside of the ship thus igniting a gas mixture present there. But according to exhaustive experiments, a hydrogen-air mixture cannot be ignited by flying sparks even under circumstances much more favorable than those existing at the airship; apparently the heat energy of the sparks is too small for that. (a) Disturbances in the electrical equipment of the airship. The electrical plant is situated between frames 140 and 156. It contains two generators for 220 Volts, which are powered 07 a Diesel engine each and deliver mainly the power for illumination, heating and Radio transformers) in addition a 24-volt generator is attached to each Diesel engine which supplies instruments and emergency lighting through batteries. All wiring, plugs and switches of the installation have been installed according to the safety regulations of the mining authorities. In the neighborhood of the location of the presumed first fire, there are of electrical devices only the precision pressure meters, which transmit electrically the record of the pa pressure within the gas cell to the control car. The precision pressure mater (see Illustration #15) contains a membrane which rests against a plate on springs. An electrical resistance element is solidly connected to the plate in potentiometer coupling, whose relative resistances change with the position of the plate. The current transfer between the fixed part of the pressure meter and the movable resistance element is done through rollers. It is now conceivable that with very dirty rollers a spark may appear at this spot, which could ignite a hydrogen-air mixture present there. But in experiments jointly conducted by the Luftschiffbau Zeppelin and the radio electric testing station Graefelfing, the ignition of the hydrogen-air mixture without the body of the pressure meter never succeeded even under circumstances which were especially favorable for spark formation. As furthermore, the accumulation of a hydrogen-air mixture within the housing of the precision pressure meter due to its good ventilation within the axial walkway of the airship is quite improbable, a disturbance at the precision pressure meter can be excluded as the cause of ignition. High-frequency impulses can be created under certain circumstances through induction effects by a strong short-wave transmitter working near the airship, which leads to an electrical discharge within the ship. This suspicion seemed especially pertinent because the explosion happened at that moment when a pendant consisting of wire cable was paid out from the rear of the ship. During the landing, only a local direction transmitter was working on the Lakehurst station, whose frequency was 278 kilocycles and whose transmission energy was 15 watts. The airship was about 600 meters (1,969 feet) from this transmitter at the moment of ignition. The field energy at the position of the ship was therefore so small, that it could not cause an electrical discharge. According to information from the Radio Officer of the airship station, other short ware stations are not present in the neighborhood of Lakehurst. The stations situated at greater distances create only such small field energies at Lakehurst, as approximate calculations show, that they would be insufficient for a spark discharge. The radio station of the airship has not operated during the landing. As is apparent from the record of the radio communications be¬tween the ship and the Lakehurst station, the last communication between the ship and the ground was exchanged on a long wave at 1810 (6:10 PM), that is 15 minutes prior to the start of the fire. A discharge on any part of the ship by its own transmission equipment is therefore also impossible. In landing an airship, the ship, floating at some altitude, is connected with the ground by the more or less well conducting landing ropes in a more or less speedy working electrical equalization process. The self charge and the unbound induced charge of the airship flow down to the ground, the framework and connected metal parts of the ship joined to it taking up the ground potential. All equipotential surfaces pass out over the upper edge of the grounded airship. Especially over the bow and particularly over the protruding parts of the stern, as for instance on the stabilizing fins an increased potential gradient results. At the time of the landing there probably existed at Lakehurst, strong electrical disturbances in the atmosphere. The fact that direction and temperature of the wind changed, made the occurrence of a secondary thunderstorm probable. Under such conditions, experiences show that an increase of the potential gradient close to the ground has to be reckoned with and hence, in this case especially increased over the vertical fin of the ship. Between ship and atmosphere, the occurrence of a brush discharge or St. Elmo!s fire could be well conceivable. As a hydrogen-air mixture burns nearly without color, under the given circumstances the first ignition could have happened on the upper part of the vertical stabilizing fin and could have quickly spread to the leading edge of the fin on the ship’s body. As experiments in the D.V.L. and in Radio Telegraphic and Air-Electric Tests Station Grafelfing have shown, temperature discharges, which lead to an ignition of hydrogen-air mixture can fundamentally be created through brush discharges. The possibility of an ignition by St. Elmos fire can therefore not be set aside, but it is premised on the presence of quite extraordinary gradients, unless assumptions are made which could hardly have been present in the case under question. A further possibility for ignition could be given by gradient changes over a time period by the different electric conductivity values of the structural elements of an airship. A Zeppelin airship is constructed from structural elements of widely different electric conductivities or different electric resistances. The framework proper consisting in the main of duralumin, the field wiring, cable controls, etc, are metallic conductors with small resistance. Between them no appreciable potential differences can obtain. But the electric resistance of the gas cell fabric, the outer cover, the landing ropes made from Manila hemp, depends very much, as they all are semi-conductors, upon the water contents or the humidity. The lengthwise and crosswise resistances of such materials can have very high values. If one wishes to discharge a charged condenser through such a high resistance, it always takes some time until the original charge is reduced to a certain fraction thereof. The higher the capacity of the condenser and the higher the resistance, the greater also is the value of this so-called time constant. If the metal framework is considered the condenser against the earth, which is connected through the landing rope, the time constant varies between one-thousandth of a second and many minutes. If on the outer cover fabric on the top of the ship there is assumed a limited wet spot caused by rain which has relatively good conductivity (the outside doping is water repellent so that such assumption can be made) then the capacity of this spot is connected over the resistance of the layered outer cover fabric with the metal framework and and finds a time constant amounting in value to seconds, according to the size of the area. In field changes of atmospheric electricity taking place quickly in point of time, between the wet spot which, as a conductor finds itself in that atmospheric electrical field part which extends by the girder construction of the airship from the outside to the interior, and the framework itself as also between the framework and the earth, potential differences occur, the equalization of which in time is prescribed by the respective time constants. If the manila landing rope conducts relatively well, and the outer cover relatively less well, then with sufficiently large and speedy changes of the electrical gradient, the tension differences can be sufficient for the formation of an ignition spark through the outer cover fabric. Both conductors, airship structure and the layer of dampness find themselves within quite different conditions with external field changes. The free electricity of the influx charge of the airship can then flow down quickly to the earth and the airship assumes very quickly earth potential, but the free electricity of the humidity layer cannot as quickly flow off harmlessly; it jumps over to the framework in the form of a spark if the tension difference is high enough and starts the catastrophe in the presence of inflammable gas mixture. During the execution of model experiments in the Radio Telegraphic and Air-electric Test Station Graefelfing, during which the electric earth field was represented by an artificial one, and during which those conditions were logically re-created which probably were present during the landing, in many cases ignition of the hydrogen-air mixture could be produced. Besides the electric phenomena caused by the exterior field, other charge conditions also can appear on an aircraft. So it was previously proven by the Test Station Graefelfing and the D.V.L. that running gasoline engines effect a division of electricity. The one charge remains on the aircraft, the other flown off with the exhaust gases. As was to be assumed and as more recent investigations at the D.V.L. have proven, the charge of Diesel engines is considerably higher but still not sufficient for a probable explanation of the “Hindenburg” misfortune. It may also be mentioned that under certain circumstances with the escape of lifting gas, electrical charges and ignitions are caused. In this case, the gas carries solid or fluid particles along the opening edge with sufficient speed. This phenomenon plays a role in the flow of compressed gas from high-pressure containers, but cannot lead to ignition during the exit from gas cells due to the low speeds of the flow. Finally, the possibility was thoroughly discussed whether “ball lightning” could have caused a leak in a cell of the ship and at the same time ignition. The presence of ball lightning was indicated by the description of the first appearance of fire by several witnesses, who expressly emphasize that the first fire did not have the form of tongues of flames but rather had appeared like a barrel or a neon light. In the literature at home and abroad, ball lightning is similarly described. But since they mostly appear in connection with line flashes and the visible thunderstorm had passed over Lakehurst a longer period before, this explanation seems misleading. During the landing approach a leak developed in gas cell 4 or 5 in the rear of the ship perhaps through tearing of a wire, through which the hydrogen entered into the space between cell and outer cover. In this way an inflammable hydrogen-air mixture formed in the upper part of the ship astern. (a) Due to atmospheric electric disturbances at the time of landing of the airship, the electrical gradient near the earth was so that it led after grounding of the whole ship at the location of its highest increase, namely at the stern, to brush discharges and in that way to ignition. (b) After dropping of the landing ropes, the surface of the airship’s outer cover became less well grounded than the framework of the airship due to the lower conductivity of the outer cover fabric. At rapid changes of the atmospheric field, which are the rule during night thunderstorms and have also to be assumed In this present case, electric potential differences occurred between spots of the ship’s exterior and the framework. In case these spots were sufficiently moist, which was especially probable in the region of cell 4 and 5 in consequence of the previous passage through a rain area, those differences could lead to equalization of tension by a spark, which possibly caused ignition of a hydrogen-air mixture present over the gas cells 4 or 5. Of the two cited explanations the one under (b) appears to be the more probable one. Thanks for making this available – most interesting! Personally, I think the evidence of a leak in cell 4 is beyond question, however, I would be surprised if a broken wire caused it, the Germans are far too good engineers for that to happen!